Like the card from Denmark this card is contains a postal address so that we would be able to stay in touch. The comment ‘wish I had a chance to see you’ reflects the often held American view that Europe is all one country; London and Paris are a stone’s throw from each other and virtually inter-changeable! Although London and Paris are very close physically, speak to a native of each and you will soon be clearly apprised of the distinct cultural and language differences between the cities! Not to mention the English Channel (or La Manche) which separates the two countries. John O was the friend of Chris – they shared a place together just outside Los Angeles. I first met Chris in 1981 as I travelled to Norway on a ferry from the UK; during the journey Chris and I played cards, he was older than me, and took me under his wing; it was a 24 hour journey and my first time away from home; we exchanged addresses – this being well before the era of mobile phones and the internet. When, in 1982, I visited America with the Canadian boyfriend I contacted Chris and we stayed at his and John’s home in California for a week. John had plans to visit Europe some day – which he did in 1984. I have not seen Chris or John since that week in 1982 and have lost touch with both of them. 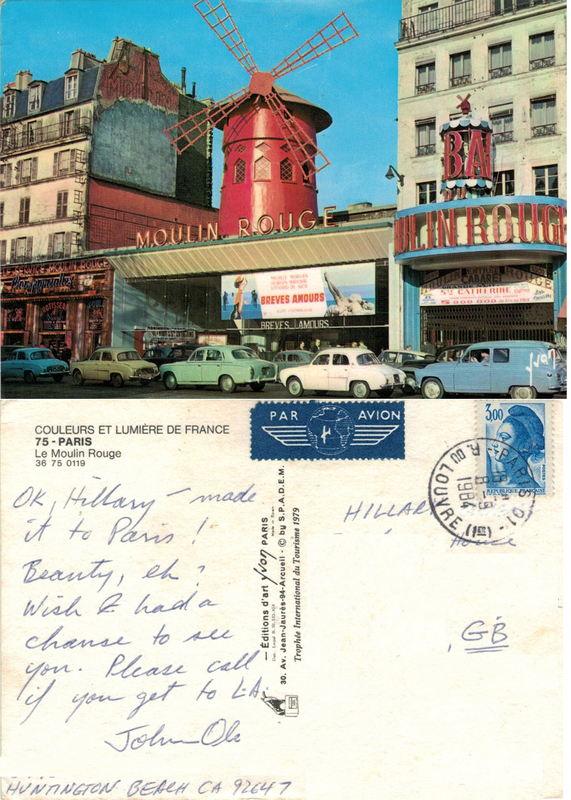 This entry was posted in Friendship, History, Journies, Life Path, Nostalgia and tagged California, culture, Facebook, friends, history, Los Angeles, Moulin Rouge, Paris, postcards, Social Media, The Channel, writing. Bookmark the permalink. Thank you – I am really enjoying the process; the best bit is that I am reconnecting with old friends and catching up face to face, in real life!